That my last post on here was a flippant declaration of my stance on style over baby-proofing? And my beautiful mirrored coffee table was banished to the basement and we replaced it with little stools that are covered in fabric, have rounded edges and won’t kill my baby. They are chevron. They are from Home Goods. Obvi. 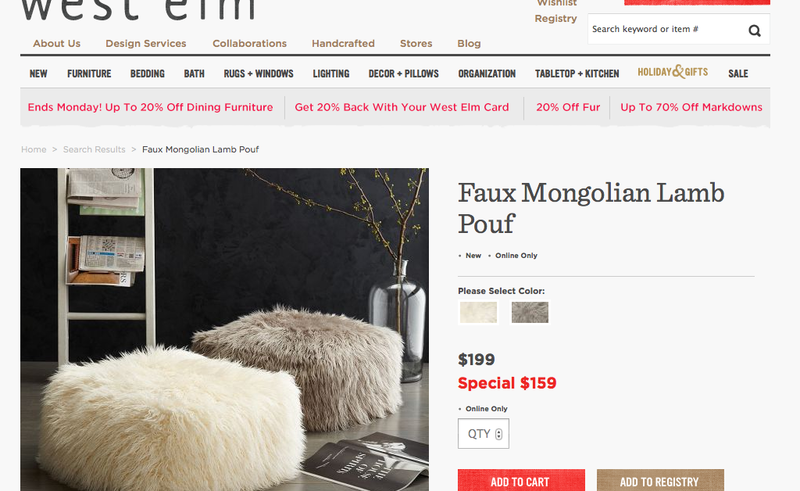 West Elm’s Faux Mongolian Lamb Pouf. And I decided that I needed my living room back. but the decorator in me was sick of looking at toddler-sized trains and mini Fisher Price Houses. And so I made a decision. We have this sunroom; this great enclosed space with French doors. And because our pottery barn table and chairs were ruined in the flood, I decided to make this our downstairs playroom of sorts. And that I have a pouf. No. No no no. I don’t speak that language. I don’t care that I have an enormous, almost walking 9 1/2 month old. 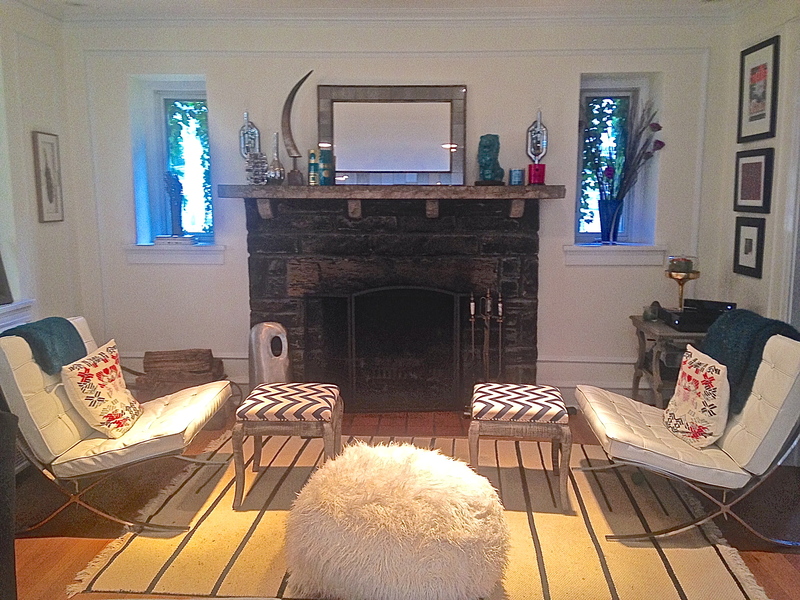 I will not compromise all of the hard work and style I have put into my decorating. 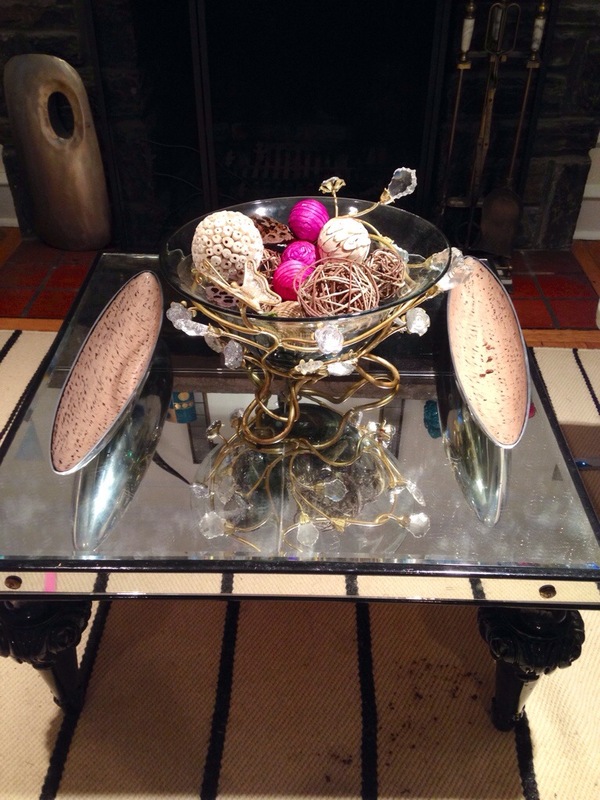 Except…I have a mirrored coffee table in my living room. And on it is a glass and crystal bowl. And in the bowl are colored and textured balls. And now, on the carpet in front of my table, I have ball crumbs. 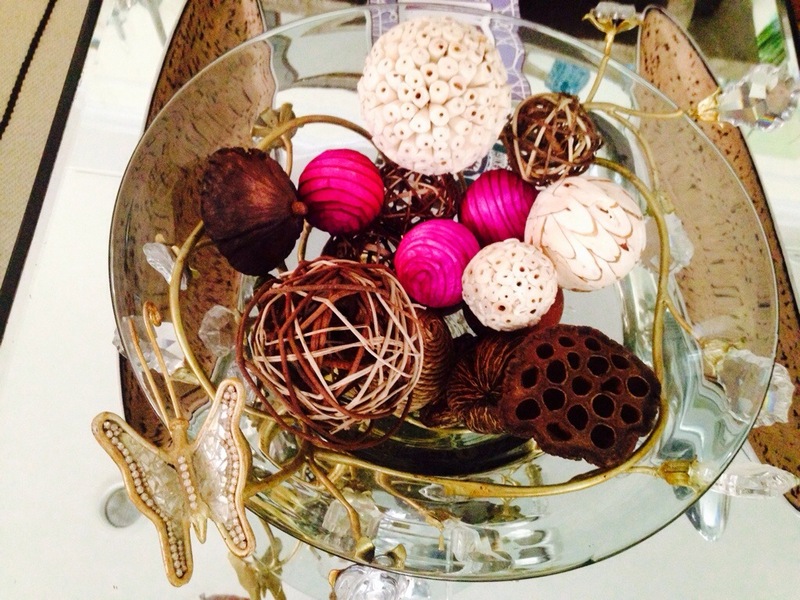 Because babies like to crumble decorative balls. And bang things on mirrored tables. And I’m not baby proofing. Not yet. This used to be easier. Like when he was in utero or immobile. But now, I will hold onto my balls for as long as I can. And jeez Louise, YOU get your mind out of the gutter. And kid, get your hand off my coffee table balls. My dear friends, it’s been so long. I have been neglectful over here on 511. I’ve been busy with life and work and Mommy. 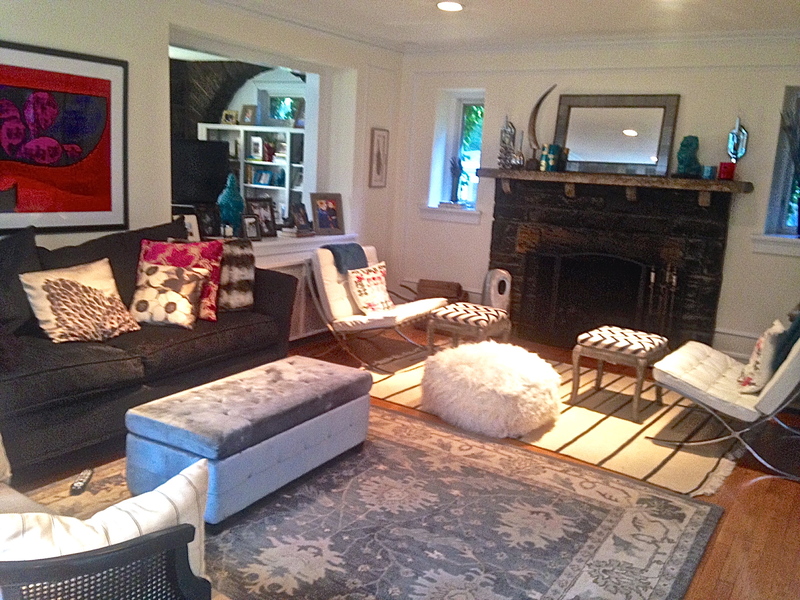 And also, I had kind of reached a decorating plateau. I literally have no more wall space to cover. I have not a throw-pillow-less-chair. Because decorating was such a huge and integral part of my winter (Home goods was my Home) I kind of did everything that I had to do and was able to do for the time being. I have been squirreling away some stories over here. I have had the honor and pleasure of starting on a big project, my best friends’ new home that I mentioned months ago is coming to life! They made settlement and have been making major changes, like putting on a new roof, staining the floors, and OMG they are painting everything top to bottom. This means that I got to spend an hour with my buddy J and he and I went through every single room in the house holding up swatches, taping electrical tape in strategic spots on the ceiling and arm wrestling over the color taupe. But their home deserves a post of it’s own (or many posts, I should say). so I will get to that. It is so exciting! When it comes to my house, I have made a few little updates, and am actually planning a new paint job for my very first room of my very first post, thanks to the incredible Paul the Painter extraordinaire. But here’s a tiny little update that made my heart swell a few big sizes. It’s a good reminder. A really good reminder. 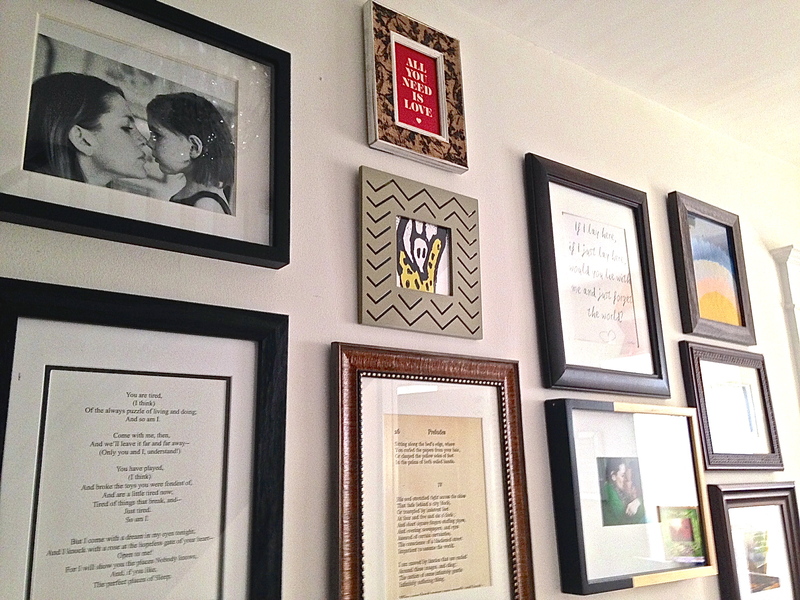 And this wall that was once a source of great question and confusion for me has really come to life; it is now a tapestry of our favorite words, photos, songs, lyrics, images…it is us, on one, big, long “White Dove” hallway wall. 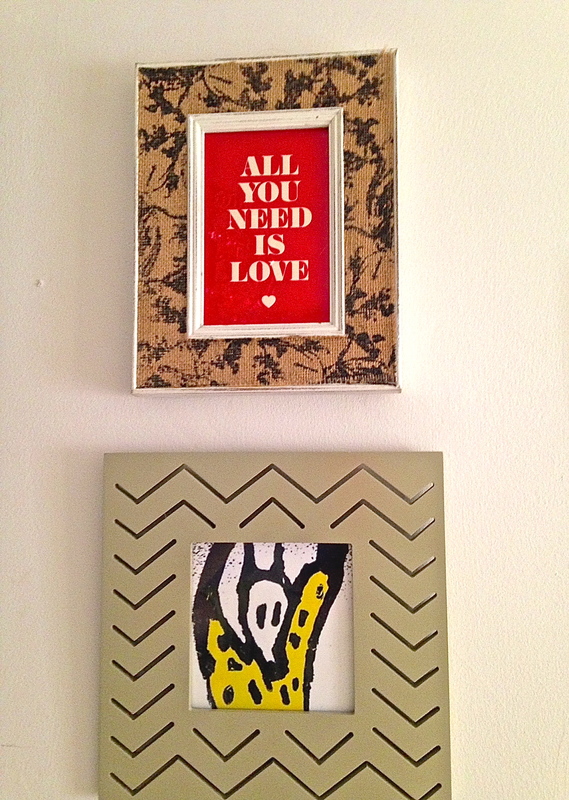 This entry was tagged all you need is love, beatles, benjamin moore white dove, Decor, decorating, design, Frames, friends, Gallery Wall, Home Goods, mommy ever after, paint colors, Rolling Stones, voodoo lounge. Bookmark the permalink. I walked into my Mom’s house this morning in my usual morning flurry; she will be driving the biggie to camp and watching the baby. And she said, “This is for you. 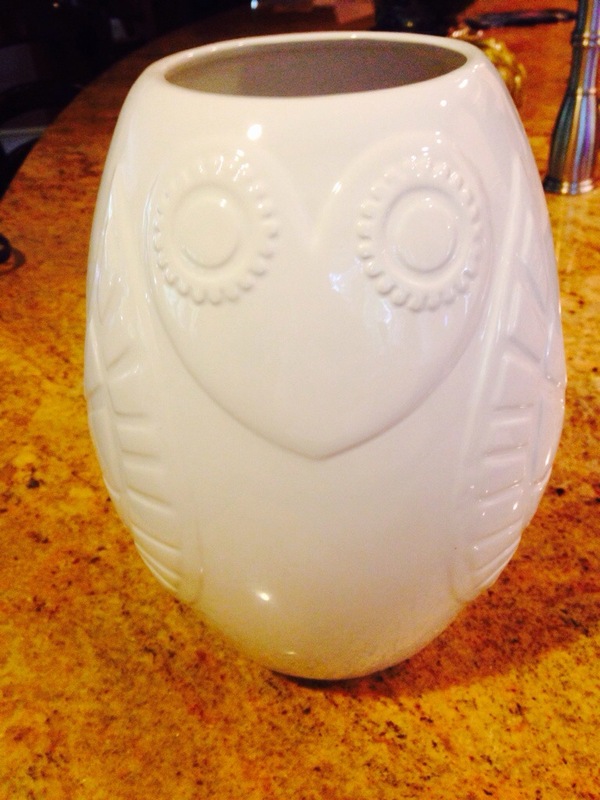 It’s Jonathan Adler and a bird.” As if I didn’t know. 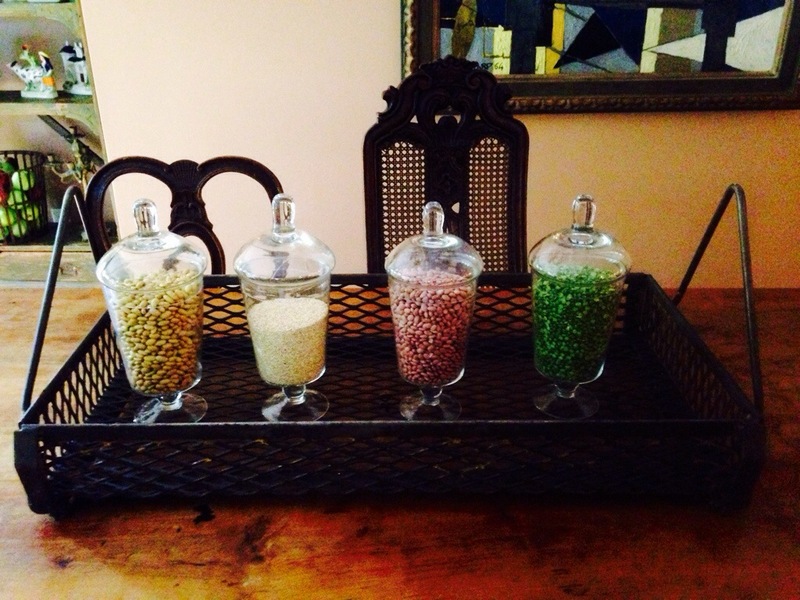 Then she showed me some of her most recent Lambertville finds: an amazing iron sconce for their great room and this basket for their table. And look how she did it up, she did. I’m thinking of doing something similar, but with lavender. But first, I have a new vase to fill.